SInce last week, I am the owner of a UV-5R dual band transceiver. On e-bay you find plenty of offers for this type of radio. I bought the rig for 25 euro's. 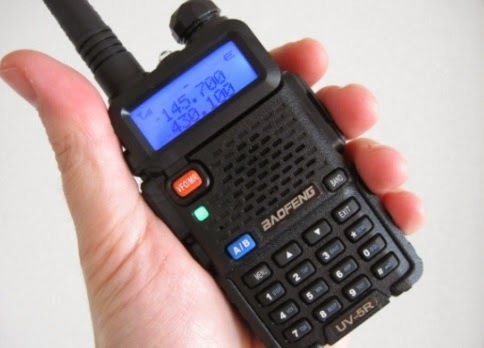 The Baofeng UV-5R is a compact handheld transceiver providing 4 Watts in the frequency range of 136-174 MHz and 400-480 MHz. It is a compact transceiver that includes a special VHF receive band from 65 - 108 MHz which includes the regular FM broadcast band. Dual watch and dual reception is supported. You get up to 128 memory locations. Selectable frequency steps include: 2.5, 5, 6.25, 10, 12.5 and 25 kHz. RF power selectable at 4 or 1 Watts. This radio comes with ANT5 SMA-J flexible antenna, BL-5 Li-ion battery (7.4V 1800 mAh), belt clip, wrist strap, AC adapter (8.4V 600 mA) and drop-in charging tray. This radio has been provided with a male SMA antenna jack. I found the control of the radio rather straight forward (menu driven) though programming the memory channels was not that easy. This weekend I have been able to contact some nearby repeaters (Zoetermeer 145.750 MHz, Rotterdam 430.300 MHz, Den Haag 430.350 MHz). Allthough I enlarged the microphone opening in the housing, I received some complaints that the audio modulation on 70 cm is too weak.